Glyphosate is a major component of Monsanto’s Roundup herbicide. It was created and manufactured on a mass scale by Monsanto and is one of the most widely used herbicides in the world. A number of scientific studies surrounding glyphosate have shed light on the danger it posses to the human body. A new groundbreaking study has now found that the most active ingredient in Monsanto’s best selling herbicide “Roundup” is responsible for fuelling breast cancer by increasing the number of breast cancer cells through cell growth and cell division. The study is published in the US National Library of Medicine (4) and will soon be published in the journal Food and Chemical Toxicology. 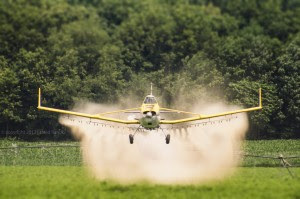 Several recent studies showed glyphosate’s potential to be an endocrine disruptor. Endocrine disruptors are chemicals that can interfere with the hormone system in mammals. These disruptors can cause developmental disorders, birth defects and cancer tumours. Researchers also determined that that Monsanto’s roundup is considered an “xenoestrogen,” which is a foreign estrogen that mimics real estrogen in our bodies. This can cause a number of problems that include an increased risk of various cancers, early onset of puberty, thyroid issues, infertility and more. Scientists also recently discovered that the Bt toxins found in Monsanto’s crops are damaging to red blood cells which are key to delivering oxygen to the body. They have been linked to cancer and kidney function decline. You can read more about that here. It doesn’t stop there, Monsanto’s roundup was also linked to Autism, Parkinson’s and Alzheimer’s disease not to long ago. When you ingest Glyphosate, you are in essence altering the chemistry of your body. It’s completely unnatural and the body doesn’t resonate with it. P450 (CYP) is the gene pathway disrupted when the body takes in Glyphosate(3). P450 creates enzymes that assist with the formation of molecules in cells, as well as breaking them down. CYP enzymes are abundant and have many important functions. They are responsible for detoxifying xenobiotics from the body, things like the various chemicals found in pesticides, drugs and carcinogens. Glyphosate inhibits the CYP enzymes. The CYP pathway is critical for normal, natural functioning of multiple biological systems within our bodies. Because humans that have been exposed to glyphosate have a drop in amino acid tryptophan levels, they do not have the necessary active signalling of the neurotransmitter serotonin, which is associated with weight gain, depression and Alzheimer’s disease. Obviously, the chemistry behind Glyphosate is known by Monsanto. The fact that it disrupts the CYP gene pathway, the enzymes that play a major role in body detoxification is something that can easily contribute to illness and disease. I wonder if this has a direct correlation to the pharmaceutical industry possibly? The same major financial institutions that own major biotech and food corporations also own most of the major pharmaceutical companies. Mainstream media in North America will always promote GMOs and Roundup as well as emphasize their safety. That couldn’t be further from the truth, they damage your DNA and RNA genomes, not just for profit but for experimentation and control. Fidelity investments, State Street Corporation, JP Morgan Chase and The Vanguard Group seem to own all major food corporations and pharmaceutical companies (1)(2). It’s good to see more alternative media outlets sharing, and spreading information around the world together. The world is experiencing a mass awakening like never before, and it continues to move forward at an exponential rate. We are living in exciting times, aren’t we? Monsanto’s roundup alone is cause for so many concerns, and can create several health conditions within the human body. Why are we ingesting this stuff? Why do we allow this stuff? Food Matters. We are What we Eat!